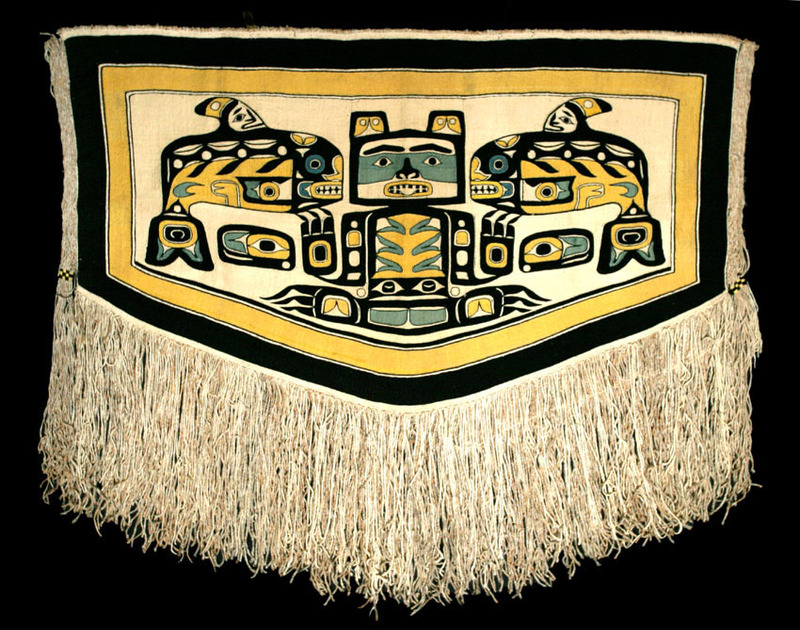 A Superb Chilkat Dancing Blanket, Tlingit Tribe, Chiefly Robe of Nobility on the Northern Northwest Coast, Late 19th Century, Length: 56 in. (142 cm. ), Width: 64 in. (162 cm. ), with a unique design, superb graphics, and a super-fine weave. Provenance: It was purchased by Zane Grey during the 1920s-30s from the Nugget Shop in Juneau, Alaska. Steve Brown states: Another weaver who learned the techniques in the nineteenth century and continued weaving into the twentieth was named Martha Willard, whose Tlingit name was Auk Tlaa. A photo of Ms. Willard in the Sheldon Museum in Haines, Alaska, shows her with a pattern board painted with this whale and bear design, a strong indication that she was the weaver of this particular blanket or robe. Additional examples identified as her work in that museum also show many similarities of design with this robe, a further indication that she was most likely the weaver. At the time of that photo, Ms. Willard appeared to be at least 75-80 years of age, suggesting that she may have been born between 1850 and 1860.